Equipment for transporting and housing coal sits idle in Cowen, W.Va. Since the natural gas boom, several mines in Webster County have either slowed or shut down operation, laying off hundreds of workers. Rich Lewis worked as a miner for almost two decades before being laid off by Arch Coal. He says he's considering taking a job at another mine, but it's not certain that mine will stay open. Four years ago, something started to change. First it was slow, and then this past month that change became dramatic. Coal now generates just 34 percent of our electricity, down from about 50 percent just four years ago. Now, the loss of coal as the dominant energy source is having damaging effects on the towns that once relied on the black rock for their livelihood. In front of the historic courthouse in Webster Springs, W.Va., in Webster County, a huge slab of shiny, black coal sits as a symbol of what helped build the county of about 9,000 people. Last month, Arch Coal, the operator of one of the biggest mines in the county, announced a round of devastating layoffs — more than 1,300 employees in West Virginia and Kentucky alone. Between the other big players in central Appalachia — Consol, Patriot, Alpha — thousands more jobs have been lost. This past week, Patriot Coal filed for bankruptcy protection. "I've never seen anything as quick as this to devastate the market, and this many layoffs at one time," says Thomas Clark, publisher of The Echo newspaper and a mine inspector for the past four decades. "It's been a landslide." A few miles from Webster Springs, outside the town of Cowen, W.Va., a massive steel hopper stands silent like an abandoned roller coaster. Just a few weeks ago, it was humming with the sound of thousands of tons of black coal coming down the mountaintop mine along a giant conveyer belt and into a silo the size of a 15-story building. For 19 years, Rich Lewis worked as a miner on this mountain and for most of those years he was able to work as much as he needed, including weekends and overtime. "For 17 years it was work all you [want to] work," Lewis says. "We [were] shipping anywhere from 30 to 35 trains a month ... in the last year and a half it went down to 20 trains a month." Today, there are no trains to collect the coal, and they won't be coming back here — ever. When Arch Coal gathered all 170 employees to make the grave announcement, Lewis' superintendant told them they were selling the coal at $56 a ton, but it was costing $70 a ton to operate with all of the equipment they used. Everyone, including Lewis, would be laid off. Of the three mines in Webster County, just one is still operating today. Todd Bragg, a friend of Lewis' and fellow miner, had been mining since he was 19. Before he was laid off by Arch Coal a few weeks ago, the 37-year-old had been making more than twice the median income of $25,000 in Webster County. "[It] helped me survive, paid for my family ... everything," Bragg says. "It's a shock to everybody. What are we going to do?" Still, Bragg and Lewis are grateful. Arch Coal gave them two months' severance and will cover their health insurance until Thanksgiving. For many people in Webster County, the general consensus is that the Environmental Protection Agency and tough new regulations are the main culprits behind what's hurting the coal industry. Back in March, the EPA announced standards that require all new coal-fired electricity plants to cut carbon emissions by half. It's an expensive proposition, and it's leading many power companies to back away from coal. But to get to the heart of what's really killing coal, you have to travel south from Webster County about 500 miles, to Atlanta. At one of Georgia Power Co.'s newest plants in metro Atlanta, two gas turbines and one steam turbine generate about 840 megawatts, enough energy to supply about 25,000 homes, says plant manager Tony Tramonte. "It is part of our commitment to our customers to provide reliable, low-cost energy," he says. Railroad tracks once led to the facility and, every two days, a 100-car train would pull up filled with coal. Tramonte says they once consumed 5,000 tons of coal a day, but no longer. Those tracks are now dismantled and the old coal turbines are gone. "There's a 100 percent reduction in mercury emissions ... [and] a 50 percent reduction in the rate of carbon dioxide production," he says. He also says there's a 99 percent reduction in sulfur dioxide and about a 90 percent reduction in nitrous oxide, with a plant that's now five times larger than the one it replaced. Domestic natural gas is killing coal because it's cheap and abundant. Four years ago, electricity generated by gas was twice as expensive as coal. Today, gas is less than half the price of coal. "What that means is, literally, natural gas is going to kill more coal-fired power plants than the EPA regulations," says Michael Zenker, a coal analyst for Barclays. In 2012, Zenker says, a perfect storm of sorts took place that sent coal down a deep spiral: an unseasonably warm winter, a significant reduction in electricity demand and, most importantly, hydraulic fracturing or fracking. Fracking is the controversial process by which gas can be extracted by drilling deep into rock formations. A decade ago, not a single drop of American gas was produced this way; today one-third of all our gas is now the product of fracking. Last month, for the first time in U.S. history, natural gas generated as much electricity as coal. "We could see coal down at 15 or 20 percent of electric supply over the next decade," says David Victor, a fossil fuel expert at the University of California, San Diego. "That would be a huge change in an industry that historically has relied on coal for 50 percent or more of the electric supply." There have been times when coal's demise has been prematurely predicted, most notably in the 1980s. But the U.S. is still a coal powerhouse, often called the Saudi Arabia of coal. This time, though, says Victor, is different. "We were talking about the death of coal in the '80s, but coal was half of the electric power supply, it didn't change very much," he says. "Now we're talking about ... terminal illness for coal in the advanced industrialized countries, and it is actually happening." For places like Webster County, the consequences are real. Todd Bragg and Rich Lewis are considering taking jobs at a mine in Grafton, W.Va., about 100 miles away. The owners of that mine say it'll produce coal for the next 30 years. But with higher costs and declining revenue, that promise is questionable. For Bragg, it could be the difference between unemployment and a few more years of security. "That'll be close to retirement age, if it lasts," he says. "With gas the way it is now, you don't know what's going to happen." At some point today, you'll probably flip on a light switch. I'll do it right now. RAZ: Now, that simple act - flipping that light switch - it connects you to the oldest and most plentiful source of American electricity. Since the early 1880s, when Edison and Tesla pioneered the distribution of electrical power into our homes, most of that power has come from the process of burning coal. But something started to change about four years ago. First, it was slow, and then this past month, that change became dramatic. Just four yeas ago, coal was still king. And that light switch, or your blender or your TV set - coal powered half of it. But today, coal share of U.S. electricity is down to a third, and it's falling. Today and tomorrow on the program, we're going to take a closer look at what's killing king coal, and what that might mean for the economy and the environment. Our story begins smack in the middle of West Virginia - Webster County; population, 9,000. Webster Springs is the county seat here. It's a small town built around an historic courthouse. Right in front, the symbol of what built this county - a huge slab of shiny. black coal. We came to Webster County because last month, Arch Coal, the operator of one of the biggest mines here, announced a round of devastating layoffs. One of our stops was at the office of Webster County's newspaper, The Echo, where we met up with Thomas Clark, the publisher and a mine inspector for the past four decades. RAZ: In the past few months, Arch Coal has announced more than 1,300 layoffs in West Virginia and Kentucky alone. Between the other big players in central Appalachia - Consol, Patriot, Alpha - thousands more have been lost. And this past week, Patriot filed for bankruptcy protection. CLARK: I mean, I've never seen anything as quick as this, to devastate the market - and this many layoffs at one time. This thing just - bam, it was here. 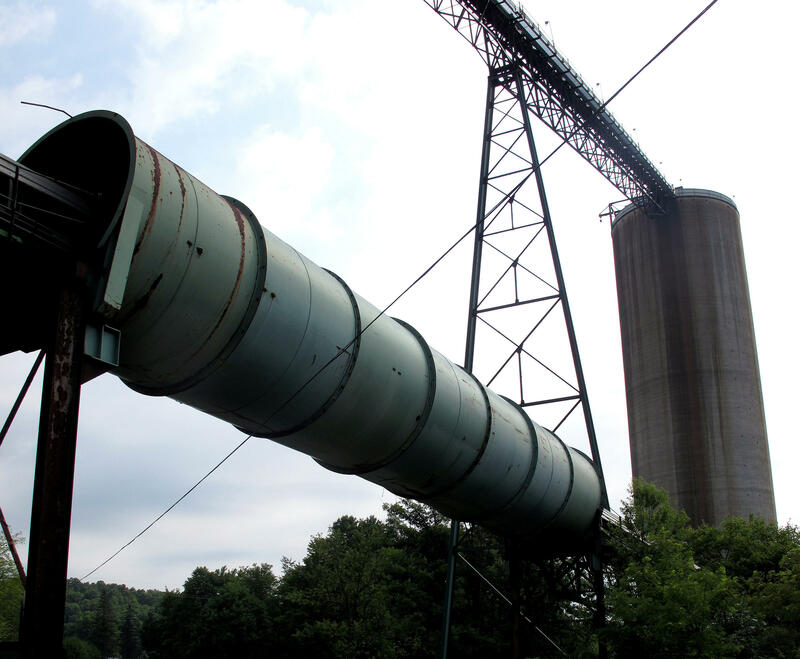 RAZ: A few miles from Webster Springs, outside the town of Cowen, West Virginia, stands a massive, steel hopper. It's now silent, almost like an abandoned roller coaster. Just a few weeks ago, this hopper was humming. It was humming with the sound of thousands of tons of black coal coming down from the eastern complex mine, right on top of the mountain above. RICH LEWIS: For 17 years, it was work all you want to work. I mean, you're looking at one here. I worked seven days a week. I worked Sundays. Over time, the more, the merrier. RAZ: For almost two decades, Rich Lewis worked as a miner on this mountain. LEWIS: We was shipping anywhere from 30 to 34, 35 trains a month. Well, in the last year and a half, it went down to probably 20 trains a month. RAZ: But today, there are no trains to collect the coal. And they won't be coming back here, ever. A few weeks ago, Arch Coal gathered all 170 employees of this mine, to make a grave announcement. LEWIS: Our superintendent told us that right now, the coal that we're selling - they was getting $56 a ton. With all the equipment we're running up there, it's costing 70 to mine it. RAZ: Everyone, including Rich Lewis, would be laid off. And today, of the three mines in Webster County, just one is still operating. TODD BRAGG: Turn some lights on. RAZ: Should we take our shoes off? BRAGG: No. No. You're fine. RAZ: About three miles down the road from the eastern complex mine, 37-year-old Todd Bragg shows us around his house. Out back, his kids are playing basketball. Todd Bragg started mining at age 19, and he's known Rich Lewis since they were kids in grade school. Coal has been very good to them. The median family income in Webster County is $25,000. Up until a few weeks ago, before he was laid off by Arch Coal, Todd Bragg was pulling in more than twice that amount. RAZ: So it was a pretty good job. RAZ: When we met up with Todd a few weeks ago, the announcement was still sinking in. BRAGG: It's a shock to everybody. I mean, it's - what are we going to do, you know? And you ask your friend, what are you going to do? Me and Rich was talking today, what are you going to do? I mean, it's just - it's up in the air. RAZ: But still, Todd and Rich are grateful. Arch Coal gave them two months' severance and will cover their health insurance until Thanksgiving. RAZ: If you're looking for the best biscuits in Webster County and some good, local intel, head over to the Hilltop Diner in Cowen. The regular breakfast crew is here, downing mugs of strong coffee and lapping up plates of thick bacon and homemade potatoes. Ask any of them the reason for coal's precipitous decline here; the answer is unequivocal. STEVE WILLIAMS: President Obama's a lot of the problem because he's against the coal. He wants to shut down all coal-powered - power plants, and they'll eventually get it done. The EPA is the big problem around here. RAZ: Back in March, the EPA announced standards that require all new, coal-fired electricity plants to cut carbon emissions by half. It's an expensive proposition, and it's leading many power companies to back away from coal. But to get to the heart of what's really killing coal, you have to travel south from Webster County, about 500 miles to Atlanta, Georgia. RAZ: This is one of Georgia Power Company's newest plants in metro Atlanta. TONY TRAMONTE: (Unintelligible) output of two gas turbines and one steam turbine. RAZ: The plant manager, Tony Tramonte, is duly proud of it. TRAMONTE: Eight hundred and forty megawatts - that's enough energy to supply about 250,000 homes. RAZ: Railroad tracks used to lead right up to this facility. Every two days, a 100-car train would pull up, filled with coal. RAZ: Today, those railroad tracks are gone, dismantled; the old coal turbines mothballed. Georgia Power, like a growing number of power companies, is ditching coal and switching to natural gas. Tony Tramonte explains one reason why. TRAMONTE: Overall, the air-quality improvement is dramatic. Now, there's 100 percent reduction in mercury emissions; a 50 percent reduction in the rate of carbon dioxide production; a 99 percent reduction in sulfur dioxide; and about a 90 percent reduction in nitrous oxides - with a plant that's now five times larger than the one it replaces. RAZ: The bigger reason, though, is simpler: money. Four years ago, electricity generated by gas was twice as expensive as coal. Today, gas is less than half the price of coal. MICHAEL ZENKER: And what that means is, literally, natural gas is going to kill more coal-fired power plants than the EPA regulations. RAZ: That's Michael Zenker, a coal analyst for Baclays. In 2012, he explains, a perfect storm of sorts took place, that sent coal down a deep spiral - an unseasonably warm winter, for starters; also, a significant reduction in electricity demand because of the economy; and most importantly, technological advances that have brought cheap and abundant natural gas. Much of this is due to hydraulic fracturing, or fracking. That's the controversial process by which gas can be extracted by drilling deep into rock formations. A decade ago, no American gas was produced this way. Today, about a third of all our gas is now the product of fracking. And last month, for the first time in U.S. history, natural gas generated as much electricity as coal. DAVID VICTOR: We could see coal down at 15 or 20 percent of electric supply over the next decade. That would be a huge change in an industry that historically, has relied on coal for 50 percent or more of the total electric supply. RAZ: That's David Victor, a fossil fuel expert at U.C. San Diego. Think about this, for a moment - in 1988, coal generated almost 60 percent of America's electricity. Today, it's hovering at around half the amount, the lowest since the government started recording that statistic. Now, there have been times when coal's demise has been prematurely predicted, notably in the 1980s. But the U.S. is still a coal powerhouse, often called the Saudi Arabia of coal. This time, though, says David Victor, it's different. VICTOR: We were talking about the death of coal in the '80s. But coal was half of the electric power supply; it didn't change very much. Now, we're talking about - maybe not death, but terminal illness for coal in the advanced industrialized countries. And it's actually happening. RAZ: As for places like Webster County, the consequences are real. 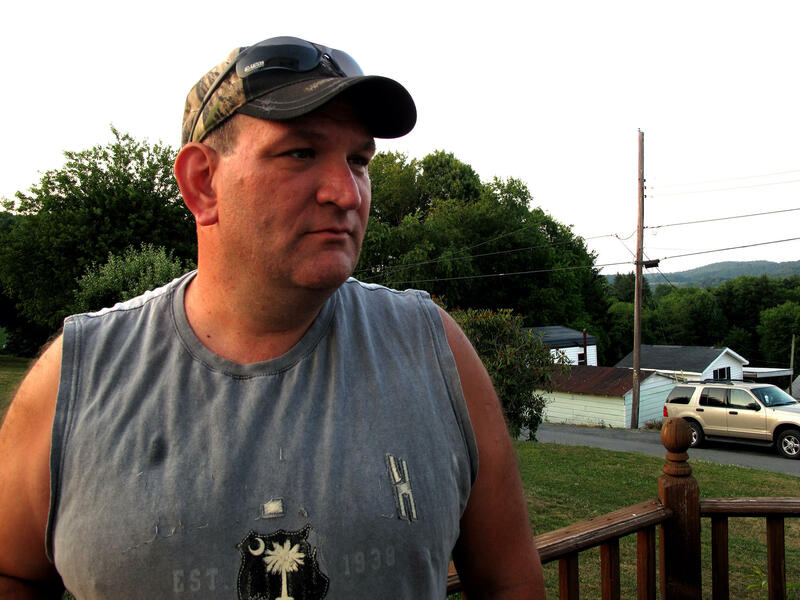 Todd Bragg and Rich Lewis, who we met earlier in the story, are considering taking jobs at a mine in Grafton, West Virginia, about 100 miles away. The owners of that mine say it'll produce coal for the next 30 years. But with higher costs and declining revenue, that promise is a big question mark. But either way, for Todd Bragg, it could mean the difference between unemployment and a few more years of security. BRAGG: ...you know, if it lasts. With the gas the way it is now, you don't know what's going to happen. RAZ: The other consequence of the natural gas boom is an unintended one. As UCSD's David Victor points out, since 2006, the amount of carbon emissions the U.S. produces has fallen by almost 8 percent - the most significant carbon reduction in the world. VICTOR: You put all that together, and the shift from coal to natural gas has reduced U.S. emissions of carbon dioxide by 400 to 500 million tons of carbon dioxide per year. And to put that number in perspective, that number is on the order of twice the total effect of the Kyoto Protocol, in the rest of the world. RAZ: David Victor says this is still not enough to slow down climate change. And with fracking comes other environmental problems. Tomorrow on the program, we'll explore that side of the natural gas revolution, in more depth. VICTOR: We need to watch out for the environmental side effects of the gas revolution. There have been some wells that have led to small earthquakes, local water pollution; there are air pollution concerns associated with fracking as well. And so we need to find ways to address those.